Amarone is one of Italy’s most prestigious red wines with a unique production method exclusive to the region. The bouquet of Cesari’s flagship wine is marked by cherry and prune aromas and jammy notes. Toasted nuances and hints of vanilla follow in this full, warm, harmonious red. A long and persistent finish is defined by bold tannins that elegantly coat the palate. 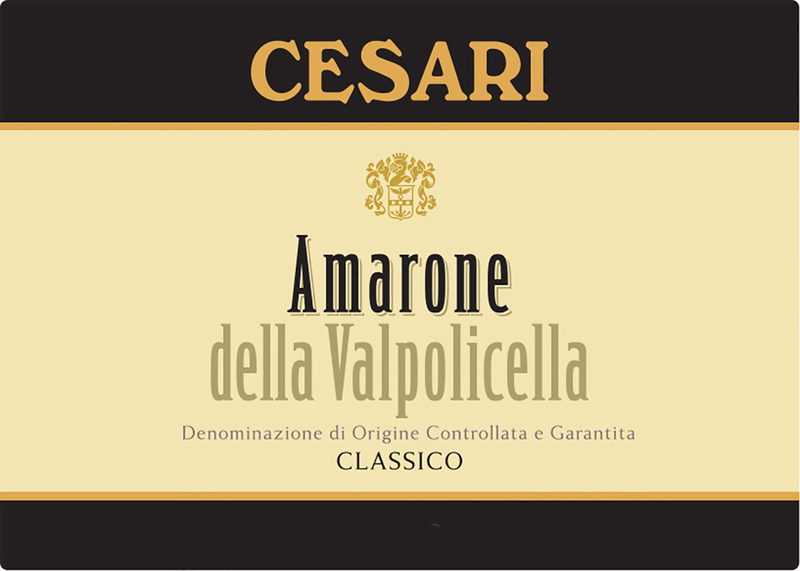 Produced from dried grapes cultivated in the historic Classico area of the appellation, Cesari Amarone is extensively aged in a combination of French and Slavonian oak barrels for a total of 3 years following fermentation in stainless steel tanks. A full and rich wine with chocolate and berry character. Soft, velvety tannins and a delicious finish. Aromas of scorched earth, underbrush, chopped herb and dark spice lead the way on this full-boded wine. The firm, hearty palate offers dried dark cherry, raisin, clove, anise and tobacco framed in solid, fine-grained tannins. This harmonious red features ripe and juicy black cherry fruit and tarry mineral character, accented by delicate spice and grilled herb notes. Fresh and appealing, with a lightly chewy finish. Dark, intense and rich with concentrated blackberry and spice; lush and deep with clean, powerful flavors; ripe, lovely and huge; an excellent Amarone at a remarkable price. The 2010 Amarone della Valpolicella Classico follows in the footsteps of this steady and consistently performing wine. A classic wine with pretty aromas of dark fruit, pressed blackberry, tobacco, tar and Spanish cedar. Bright menthol and licorice highlights also appear adding to the wine’s overall complexity. In the mouth, this Amarone is smooth, polished and persistent. Smoke, graphite, blue flower and black pepper aromas take center stage on this bold, structured wine. Velvety tannins support the dense black cherry, plum and blackberry flavors, while notes of freshly ground pepper and nutmeg add depth. Thanks to fresh acidity it’s already surprisingly drinkable, but it also displays aging potential. Drink through 2022. The beautiful ruby red color draws one in immediately and rewards with intoxicating aromas of ripe boysenberry fruit and a hint of cacao. This is followed by a refreshing burst of the outdoors in violet, rosemary and wet slate aromas. Full bodied with ripe raspberry and cassis on the palate, very well-integrated tannins. Rich and lush on the palate; a complex wine. Very well-balanced and leaning slightly toward the modern edge. Drinking beautiful now but will reward cellaring. From the Classico zone, the 2009 Amarone della Valpolicella Classico undergoes three years of oak with stints in large oak cask, barrique and tonneaux. There’s complexity and intensity here with background shadings of dried tobacco leaf, cherry cola, blackberry liqueur and worn leather. The wine shows great integration and smoothness, with just enough tannic firmness to give it importance and cellar longevity. Drink 2014-2022. Packaged in an elegantly frosted bottle, this brawny wine delivers the goods. It shows intensity, persistency and is tightly packed with luscious aromas of black cherry, leather, tobacco and black olive. The tannins are velvety and rich without being overdone. The taut tannins provide the muscle, backing flavors of juicy, sun-dried cherry, grilled herb and smoke, with hints of date and licorice and a lightly dusty finish. Drink now through 2023. Pronounced damson, cherry, plum, lush fruit texture, with good balance and elegance. Cesari’s beautiful base Amarone shows the potential of the successful 2007 vintage. There’s elegance and measured intensity here (a good thing) with pretty background shadings of soya, cola, ripe fruit and dried tobacco. This grippy red shows a rich note of fresh earth supporting flavors of kirsch, date, damson plum preserves and cigar box, with a sublayer evoking the sweet smoke of burning vine clippings. Integrated tannins are lightly chewy towards the finish. Drink now through 2022. This is a luscious, dark and delicious Amarone with really fun aromas of cinnamon and Christmas spice beyond more obvious tones of ripe fruit, prune and plum. It shows levely, rich density in the mouth as well. This fresh, juicy red is driven by a rich note of black licorice snap, mixed with flavors of damson plum and crushed currant, with accents of freshly ground spices-anise, clove and cardamom. Shows fine balance and polish throughout, with a sweet smoke note and subtle tannins building on the finish. Drink now through 2026. Seriously rich black fruits. Touch of coffee and oak. Rich, ripe and rammed with herbal, raisiny fruits. Cesari’s lush Amarone is particularly good this vintage. This is a standout wine that is distinguished by a pretty mineral note of graphite or flint that frames the fruit in an extremely elegant manner. The effect is quite extraordinary and this dense wine delivers a long, drying finish. Big intensity and power is delivered from this brawny Amarone that imparts distinctive, yet not overwhelmingly intense, aromas of black cherry, plum, resin, tar, pine and black pepper. The wine boasts good freshness, consistency and length on the finish.